Yet you didn’t need to look very hard to discern that the debonair exterior belied a very different kind of Mancini whom the Manchester City staff had to try to get down to work with. A chance conversation with one of the staff in the Etihad car park one April night last year provided the first hint that the battles Mancini was choosing to wage with so many of those within the club were something more than “Roberto being Roberto.” Mancini will “always challenge you” said that individual. That was “a positive thing”, he quickly added, though it didn’t sound like it. The public antipathy Mancini was displaying towards others within the club wasn’t on, even though the suggestion that night was that a mere “5 to 10 per cent” of the manager’s game needed to be improved. All of that was before the arrival last August of Ferran Soriano as City’s chief executive; an individual who is something of a management theory anorak, has written a book on the subject and who happens to have a bit of a bee in his bonnet about executives keeping stuff behind closed doors. Soriano is the man who wouldn’t hire Jose Mourinho for Barcelona because of his barbed press conference gibes about his own club. “He generated media conflict almost permanently and it was a potential source of conflict within the club,” Soriano has said of Mourinho. He also believes in the potential of individuals to change their management styles. At Barcelona, he encouraged his director of football Txiki Begiristain to coach the coach, Frank Rijkaard, in becoming more authoritarian. It worked for a while. But Mancini was never going to be so malleable. Platt was an important part of the club’s attempts to create a bridge to Mancini and draw him into the fold – an enterprise over which there has been no small amount of agonising in the past few years. But it was a profoundly difficult task. The club’s executives felt they were getting somewhere with their planning, a year or so back when, during Garry Cook’s tenure as chief executive, they managed to get all of the executives key to their work in the transfer market together in one room. This little “player acquisition board meeting” felt like a breakthrough, except that Mancini refused to participate. He put his head down, stared at his feet and sulked for near an hour and a half. 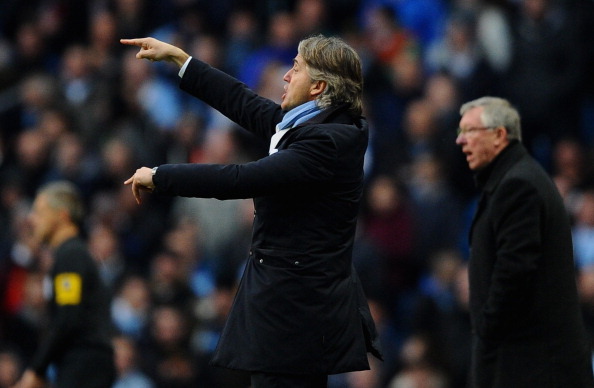 Platt tried to smooth things over, by all accounts, but that was the essence of Mancini. “In Mancini’s case, “lame duck” seems a little harsh for such a stubborn and forceful character, but that is how he finished, damp and bedraggled, after a limp City lost an FA Cup final to Wigan that really should have been theirs for the taking. But here again, those Mancini traits of stubbornness, a powerful unwillingness to step back and be prepared to change, came to the surface. The arguments will rumble for months between those who saw what he has managed as below par, given the limitless resources at his disposal, and those who see what he didachieve in his time in Manchester: a true and beguiling breakthrough for a team on one of the longest trophy sabbaticals in the English top flight. That alone, and the way it was achieved with a dramatic cup semifinal win over Manchester United and a Premier League finale against QPR that only those in the upper Amazon have not yet heard about, marked him down as someone who will live on in Manchester folklore for a long time to come. But even in these moments of triumph, came doubt. How was it possible that the title could only be won with the miracle of two goals in injury time? Surely it should have been simpler than that? How was it possible to look so underwhelming in continental combat? How could last summer render such a strange batch of hopscotch footballers, when the only way to really improve on a title-winning side is to buy the very best quality the market has to offer? There were almost as many questions as there were people crying tears of joy. It is clear from the club website’s slightly odd-sounding press release that the board does not see Mancini as the man to take the team higher than this. This might well have a ring of truth about it. The lethal cocktail of pride, stubbornness and a certain whiff of arrogance meant certain lessons have not been learned. Surely underestimating Everton, for example, is only something you can do once, not every time you play them. Tactical tinkering this season when the team seemed perfectly well-balanced already seemed a tad unnecessary, and appeared to have a destabilising effect. …With United and Chelsea starting next season with new managers, some will say City could have jumped the queue and opened up an advantage with a steady hand at the tiller. Instead, they have chosen to go down the same route of change. His fellow Italian Claudio Ranieri has guided Monaco back to the top flight of French football this season, but the owners of the Principality club believe Mancini is the man to take them forward. Mancini’s anger at his imminent dismissal at City will be tempered by a multi-million-pound pay-off – because he had four years left on a five-season contract worth about £37million. … Assistant manager Kidd is ready to step in to manage the team at Reading, where a point will ensure they finish runners-up behind Manchester United. Dressing-room unrest at Mancini’s clumsy man-management is understood to be a key factor behind his demise. His public criticism of skipper Vincent Kompany, goalkeeper Joe Hart, Samir Nasri and Micah Richards has turned most of the players against him. ← Fantasy Football GW37 preview: Walcott to worsen Wigan’s woes?